BHS Sheet Material Racks are the perfect solution for storing and transporting large, heavy sheets of material like glass or granite slabs. The angled back and deck, along with the anti-skid rubber surface, help to prevent material from tilting out. These racks are equipped with removable side arms for stacking extra-long material and four-way fork pockets for convenient transport and positioning. A properly configured material rack can offer a significant ergonomic benefit to employees. Keeping materials at the proper height can greatly reduce back injuries by eliminating the need to bend. Four-way fork pockets ensure that lift trucks can do the heavy lifting instead of staff when a large amount of materials needs transporting. Sheet Material Racks can be stacked up to three units (contact factory for capacities when stacked). Their heavy-duty, steel-tube construction makes them reliably sturdy and a powder coat finish prevents scratches and corrosion. 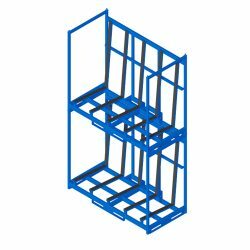 This safe, sturdy, and practical racking can make your operation more efficient and ergonomic. BHS inspects every product to ensure top-of-the-line quality. Our commitment to customer service and support continues after the sale of all BHS products with a 13-month guarantee against defective parts and workmanship. Our products have a reputation of quality and durability that we strive to protect. Secure your materials and create a more ergonomic environment with BHS Ground Racks. Contact our sales team at 1.800.BHS.9500 to learn more about our heavy-duty Material Racks or to find a local dealer.